Some hot air balloons are strikingly beautiful and some are humorously cartoonish, but all are picturesque and inspire awe as they soar into the air. 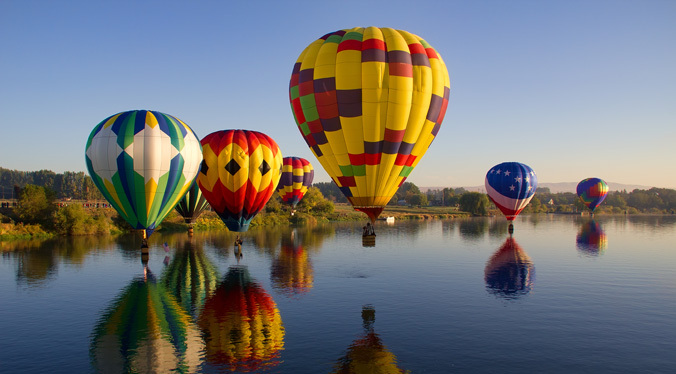 This summer and into the fall, there will be many opportunities to see and photograph them at more than two-dozen balloon festivals throughout the West. You will need to be an early riser to see most balloon launches because the three hours after sunrise are some of the best times to fly. Pilots avoid midday flights to keep away from air turbulence. 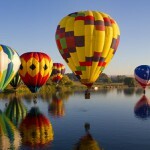 Balloons fly best in cool weather with light winds. The Arlington Fly-In will include air shows, hot air balloons, plane rides, displays of military equipment and aviation seminars Thursday through Saturday, July 11 to 13, at the Arlington Airport in Arlington, Washington. Planes from the Flying Heritage Collection, the Heritage Flight Foundation and the Vintage Airplane Museum will be on hand for this celebration of fun, flight and friendship. There will also be a large display of military equipment. Air shows will start each day at 2 p.m. There will be a hot air balloon night glow Friday evening and a night pyrotechnic air show on Saturday evening. 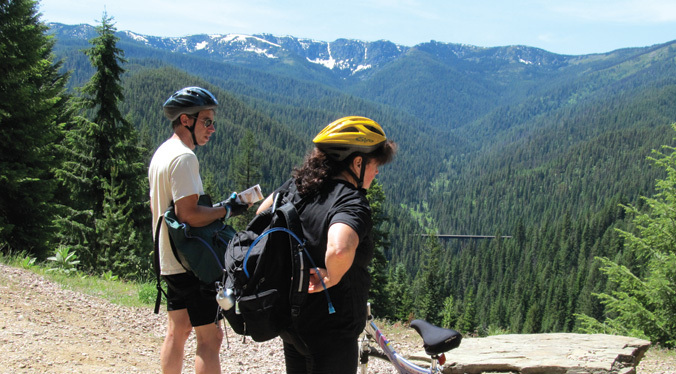 Named for the Olympian Hiawatha luxury train that once sped through the Bitterroot Mountains, the Route of the Hiawatha is now a repurposed family-friendly bike trail on the border of Idaho and Montana. Between 1947 and 1961, this route was known as one of the most scenic train rides in the world. Although the rails are long gone along this 15-mile stretch, the wilderness and wildlife are still here—as well as historic tunnels and trestles. The Route of the Hiawatha is literally a beaten path—a hard-packed dirt and gravel surface that’s mostly downhill. 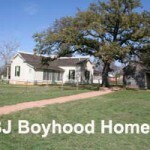 With more than 40 interpretive signs along the way, there are plenty of good excuses to stop and take a breather while learning the area’s railroading and mining history. Except for a small portion of the route, no motorized traffic is permitted, but if you listen closely, you might still hear a ghost of a train whistle carried on the wind! Most people know me as a fruit fanatic. As a child I enjoyed—make that devoured—homegrown backyard fruit ranging from gourmet mandarins to buckets of sun-sweet nectarines. And my share of strawberries never made it to strawberry shortcake as I always enjoyed the fresh berries as snack food—just rinse and eat. Many years later on a trip to the Sacramento Delta I discovered the rich, full-bodied sweetness of fresh-picked blackberries, their juice staining my fingers as I popped berries by the handful into my mouth. When we moved to Oregon, I was delighted to discover that blackberries grew wild on our property. In addition to growing strawberries, we also added blueberries, jostaberries and raspberries. 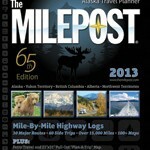 The most comprehensive and authoritative guidebook to Alaska is The Milepost, which tells you in 760 pages everything you could possibly want to know about traveling in Alaska. This year marks the 65th edition of this book, which is published in an 8.5×11-inch format. 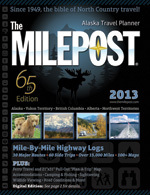 The Milepost has mile-by-mile highway logs, describing everything you will see and alerting drivers to road conditions, including turnouts, merging traffic, soft shoulders and other hazards. 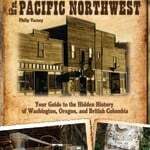 The book covers all the highways in Alaska, the Yukon Territory and the western Northwest Territories, as well as the major routes to Alaska through British Columbia and Alberta. 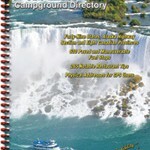 It also has detailed information about travel by ferry, cruise ship, train, airplane and RV.